They are all so great!! Haha now I know why put you on the list of ‘Funnest’ people. I wish I had wonderful talent like yours that made people feel happy and laugh ! Hey Krista!! Happy Sunday! I’m with you. Spooky is not really our thing. This is so much fun! I was trying to pick a favorite… but love em all! It’s amazing how you vary the backgrounds to give each individual panel it’s own identity! (did that sound very art criticish?) :o) Alway enjoy your work and your joyful attitude. Why that’s a perfect amount of spooky! Cuteness! brilliant work, so many cool images! An excellent illustration that covers halloween really well. I love the spider. Cute, cute, CUTE! Just my level of spooky. 😀 These look like they’d make GREAT stickers, right? Love the fuzzy spider. Hahahahaha. The only reason you know that I crack myself up is because you do, too! You must have so much FUN! Hope you’re having a thrilling weekend. Looks like everyone has already said what I’d like to say so “DITTO”! Love it!Perfect for the season:)Love the cat too! This is terrific..love the cat! 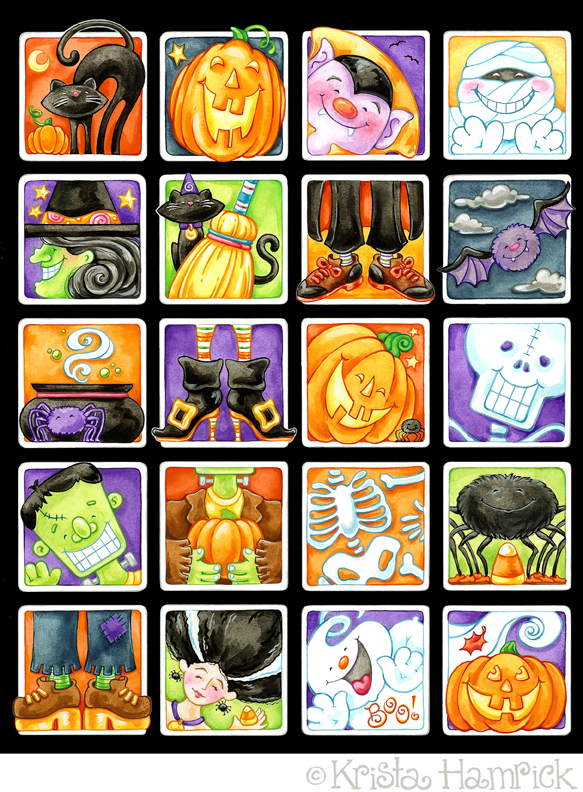 I love the arrangement of all these wonderful Halloween images. Oh my goodness who delicious spooktaular!! I love it. love it, I imagine my level of spooky will probably be on the line of “cute spooky” too if I can even find time to get to one this week. Anyway I like your cute spooky collage of Halloween images and it matches your header.